Use the landplane to grade and level unevenly distributed soil. Cut down high areas and refill into low places. Remove large clods and rocks while leveling and grading. Working in either forward or reverse, the landplane makes it easy to break up hard ground and level a surface. Use it to peel sod or aerate soil for seeding. Built specifically for the Multi-Attachment X-Change™ (M.A.X.) system on Bobcat utility vehicles, it can be easily installed by one person. Bi-Directional Operation: Allows controlled grading and leveling in both forward and reverse directions for maximum planing action. Versatility: Designed for worksite versatility, the landplane attachment can be used for transporting materials on site and for sorting unwanted debris from soil. Pulverizes soil clods and aerates soil for seeding and sodding. Even peels and removes sod. 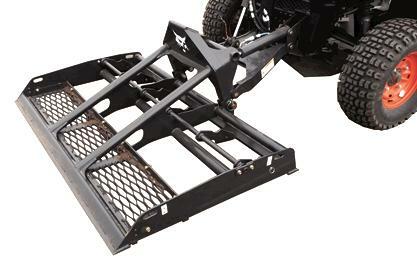 Multi-Attachment X-Change: Makes easy work of attaching and detaching the landplane from the utility vehicle. Fast and easy mounting means spending less time on attachment changes and more time on the job. Fold-Down Scarifier: Lower it to break up hard soil or retract it when not required. A floating feature allows it to scarify in one direction and float in the other. Bolt-On Screen Kit: Best for sandy to normal dirt, the bolt-on screen pulverizes and levels the soil. It also makes easy work of scooping clumps and rocks for discarding.